One of the best places to start with minimising your plastic consumption is in the bathroom - so many of us are focusing on our fight with the supermarkets and the plastic bag stand off, that we often neglect other avenues for streamlining our efforts towards a zero waste lifestyle. 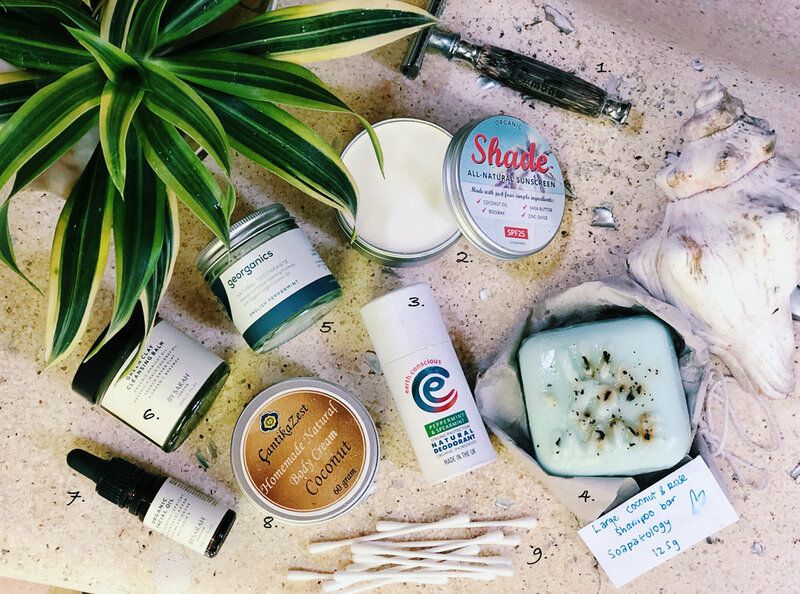 So on that note, I thought I would introduce some recent favourites I’ve discovered, leading me one step closer to a plastic-free daily routine. Some of these suggestions may spark some resistance due to costs, and I realise they may be a luxury not everyone can afford, however my stance on the whole idea of consuming is that we really are voting for the kind of world we want to live in with every single purchase that we make. We may not feel we have much power to resolve some of the great tragedies affecting our planet right now, but what we buy, and how we choose to consume, is ultimately driving the direction the world is moving in. And so with that in mind, I’ve started loosening the purse strings on the things that I feel truly matter, and cutting back on luxuries that no longer align with the end goal of a sustainable existence. It’s up to you to choose where you draw your lines, but it’s important to remember that this beast of mass consumerism didn’t just happen overnight - we have all been guilty of buying into it, and so maybe we all need to readjust our thinking as to what things ‘should’ cost, and what negative impact a bargain might have on our planet’s resources. As far as I’m concerned this one is a no brainer. Not only is it the more sustainable option for any shavers, but it’s actually the more economical one too. I picked up the razor on Amazon for £16.99, and grabbed 100 blades for under £10, and at the rate I’m going (about a blade a month), after you’ve invested in the razor, that works out as an ongoing cost of about £1 a year. Infinitely cheaper than buying crappy throwaway razors, and completely guilt-free, since you can recycle used blades! The razor also comes in a handy cardboard case so you can keep it safe on the move. I was a little reluctant and wary at first about trusting myself with what seemed like a scary tool, but actually it’s a much nicer experience and it feels like this one will last forever if looked after properly. My only suggestion is be careful where you source your blades from, as my Derby ones were unfortunately packaged in plastic boxes per 5 blades, so I would recommend double checking this with potential suppliers before making the same mistake I did! Some of you may have caught our debut blog post, in which I touched on the devastating effects the chemicals in our sunscreen are having on our coral reefs. Thankfully, places such as Hawaii have now rendered these illegal, however other countries seem to be oblivious, or too slow off the mark to remedy this. Once again, we must all take matters into our own hands. So ahead of our trip to Indonesia, I researched possible alternatives and came across this brand, which won my vote due to its plastic-free packaging, organic ingredients and great reviews. Having only recently touched down in paradise, I haven’t had a chance to test it’s durability in long exposure, however I have done a test run application and was pleasantly surprised with how easy it was to apply (the heat probably helps! ), and the ‘white cast’ was much less than feared. This is going to be an inevitable adjustment vs regular sunscreen, however it is an extremely necessary sacrifice that needs to be made by us all, especially anyone who declares themselves an ocean lover. The reefs are being attacked from multiple fronts, from rising sea temperatures to tourism destruction - the least we can do is stop suffocating them with life leaching chemicals. I stocked up with a 15ml pocket size (£2.75) and 100ml larger tin (£8.75), both of which we’re listed as damaged stock so a bit cheaper, and with postage the pair came to £14.95. Not too much of an increase in price, and I’ll report back on how well supplies lasted and underwater performance etc soon, but for now it feels great to have made the switch knowing I can now swim and dive without any fear of my impact on marine life. Having previously used the tin version of this deodorant, I was pleased to discover this easy application version in a fully biodegradable tube. I have been an avid Mitchum user in the past, for it’s seemingly miracle ability to prevent any sweating, until I stopped to think about the damage this was likely having on my body. And unsurprisingly, after a short break and using only these natural ingredients, on returning to using Mitchum on just one occasion, I actually broke out in a horrible rash, which tells me everything I needed to know about how my body felt about whatever nasties I was inflicting on my skin. It’s definitely been an adjustment getting used to the idea of perspiring again, but the fact is that it’s a natural process that the body needs to eliminate toxins, and anything that blocks the body from it’s routine mechanisms can’t be good in the long run. At £8 a tube it’s definitely on the spenny side, but I bought this for myself as a pre Christmas treat, and after 3 months of daily usage, it’s still going strong. When you factor in the lack of aluminium, plastic-free packaging and vegan, organic ingredients, for me it’s more than worth it. I came across this homemade brand on Amazon of all places, and have to say it’s one of my most admired eco packaged products. Every step of the process appears to have been crafted with nature in mind - from the ‘hand made’ embossing to the encased flower petals, the hand written note to the brown paper & string wrapping, you can’t ask for more in terms of conscious creation. I made the switch to shampoo bars at the start of last year, originally starting out with Lush’s Seanick bar. Whilst seemingly great and incredibly long lasting (the bar still exists a year later! ), unfortunately it eventually irritated my scalp too much, my hair loss was becoming worrying, but mostly I wasn’t happy about using a product with the foaming agent SLS (Sodium Lauryl Sulfate), so have opted for a fully organic product this time. This bar smells amazing, takes a minute to get a small lather (which in my eyes is a good sign), and feels super nourishing and conditioning for my hair. My curls are bouncing back with a vengeance (may have something to do with the humidity too) and at £5.90 for 125g it’s almost guaranteed to out live any competitor bottled shampoo, and look prettier while doing so. Ok so full disclosure - this one has been the biggest adjustment and probably not for the less determined. Feeling so close to banishing plastic from my washbag, toothpaste was the final component on my quest for a zero waste bathroom. I had heard the myths that coconut oil could be used for brushing your teeth, but to me this seemed a touch too maverick. That was until I discovered this natural toothpaste whilst cruising one of my fave sustainable websites, Plastic Freedom. Firstly, I was immediately sold on the plastic-free packaging, followed by the reviews claiming that this paste would ‘revolutionise my brushing experience’. Ok, they got me - I decided all I could do is try. The main difference is the lack of foaming - again, something I now know to be a positive, and a sign of lack of chemicals. One of the few items in my bathroom I can actually eat (not advised), although that’s not to say it’s particularly appetising. Although it has minty essential oils, initially I did miss that intense freshness that comes from brushing your teeth with normal toothpaste, which was replaced with a slightly peculiar sensation of just a very clean mouth. However, after persevering I can honestly say I have now adjusted to the new normal, and in my eyes the battle is worth it knowing I’m rid of one more piece of unnecessary everyday plastic. I recommend trying for yourself, or researching some recipes for homemade toothpowder, in which you might be able to up the minty fresh dose. They also do an Activated Charcoal version, which is supposed to be great for whitening. This dream team combo is a match made in heaven. My skin has never felt so soft, loved and gleaming. Everything becomes a treat after applying a few drops of this magical oil. My make up glides on and as such I need a fraction of what I was using before, and once my skin has fully recovered and rebalanced, I have a feeling I wont be wanting to wear any skin make up anymore. The amber glass bottle and pipette fit in perfectly to the zero waste goals, and I’m going to investigate refill/brand recycling options for the plastic lids for these products. Highly recommended! I picked this up last year at one of my favourite spas in Ubud, so I realise this may be off limits for most of you but I wanted to include it as an example of the type of product we can all replace our plastic moisturiser bottles and tubs with. Their whole product range is made with plants home grown in the owner’s garden, ensuring a completely fresh and low impact product. For anyone lucky enough to be passing through Ubud, drop her a visit, and if not, hopefully you can find a locally grown equivalent for a reduced footprint, and be sure to look out for tins or other sustainable packaging. It’s a mystery to me how plastic stems ever became a thing, and even more of a mystery as to what compels people to flush these down the loo, but unfortunately people often don’t stop to think about the repercussions of these supposedly insignificant daily actions. Anyone who uses cotton buds on the daily/weekly/monthly should make the switch immediately. When on a beach clean in Devon a couple of years ago I found 10 plastic cotton bud stems in a 5 minute window. It’s easy to feel like these pollution issues don’t really apply to us in the UK, but the plastic has reached us on all shores, requiring change from us all - and this one is such a simple fix. This is my one true love when travelling, especially in Bali - I pick up a big old glass bottle of cold pressed virgin coconut oil from one of the local cafes, and proceed to slather myself in it day and night, in the hope of one day transforming myself into a real life coconut. You can apply your beloved coconut oil for a myriad of uses - put it on your hair, your skin, your lips, your sunburn, your healing tattoos, and for the die hard coconut lovers you can even straight up brush your teeth with it. Since your skin is your biggest organ, they say you should only apply to your body that which you would eat. Usually this theory is a little unattainable, but in this instance, I can’t help but feel I’ve nailed it.